Sometimes our greatest resistance is our own willpower. We all have friends who never miss a day at the gym. Their obsession becomes our envy. 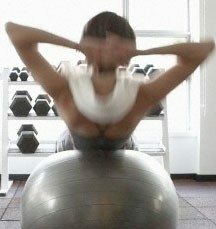 The good news is we all have the potential to match that dedication, says Tom Holland, a Connecticut-based celebrity fitness trainer, exercise physiologist, and expert in sports psychology. Here are eight proven ways to make exercise your everyday habit. There’s an urban legend that says it takes 21 days for something to become a habit, but there’s little evidence to back up this claim. For exercise, it’s probably more like six weeks, says Rebecca Woll, a personal trainer in New York City. “This is when you start to see aesthetic changes in your body,” she explains. “Once you see these changes, you won’t want to go back to the old you!” You’ll also start to notice the difference in how you feel if you miss a day or two of exercise, and you’ll start to appreciate that exercise-induced natural high. The right instructor can make a fitness class feel more like a party than a workout. “Finding an instructor is like dating,” says Woll. “If the first one doesn’t work, keep looking. This person should make you want to come to the gym!” (Just be ready for some competition: Popular fitness instructors see their classes fill up fast, and maintain loyal followings even when they switch class times and locations.) You can even glean workout inspiration from celebrity instructors and trainers. 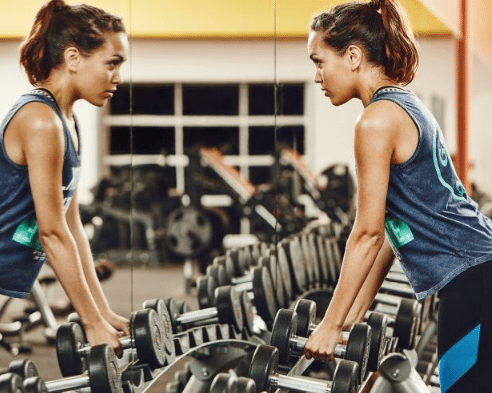 Following your fitness idols on social media can be a powerful motivator. One way to end your new exercise habit before you find your groove? Getting hurt. 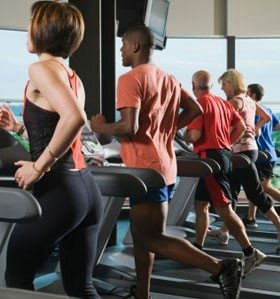 Beginners (or people just returning to fitness after a long break) need to be careful about trying to do too much, too soon. It’s normal to have some muscle aches and stiffness a day or two after working out, but if you start to feel sick or overly tired, you’re probably training too hard. Following a workout plan or working with a personal trainer can ensure you’re progressing at a reasonable pace. For some people, the feel-good side effects of exercise are enough to keep them going. Others need something a little more tangible to get themselves up and out of bed every morning (remember: at that first alarm!). If you crave the numbers, you may find that using apps, computer programs, or wearable fitness trackers help you stay on track with new routines. Technology helps you challenge yourself to new personal bests every day. Plus, many of these programs can be integrated with your social networks, like letting your Facebook support network know that you just crushed a 3-mile run or checked in at the gym. Once your friends start asking you about your new exercise habits, it may be harder to let them fall by the wayside. The most important factor in establishing a regular routine is to truly make it a habit – something you don’t even think twice about, says Holland. You can help speed the process by creating daily rituals that center around your workout: Sip a cup of coffee on your way to the gym, roll out your yoga mat in front of the TV when you wake up in the morning, or listen to a favorite song to get pumped before that 3-mile run. Soon, these cues will be signaling your brain that it’s time to work out – not time to make excuses.